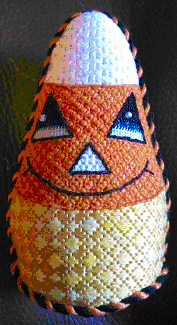 Candy corn is a favorite Halloween tradition and I couldn’t resist stitching this popular subject as a jack-o-lantern ornament. A charted poked hole pattern is used to set up the back-stitched outlines for the symmetrical figure to assure that the bilateral symmetry of the shape is maintained. Three unusual monochromatic composite patterns embellish each of the color bands, and each pattern uses two different threads. The facial features are added to the center band. The triangular eyes are interpreted in Encroaching Gobelin using three different metallics and a white bead for the iris. The triangular nose is stitched in Parisian. As either an ornament or a stand-up, this charming design is sure to play a festive role in your annual Halloween celebration. Several threads can be shared among multiple participants. 1 ball #332 orange (now discontinued so DMC #608 has been substituted, but the text is written for the Anchor thread).